RASTA introduced a project on Integrated Water Resource Management with the financial support of CII (Confederation of Indian Industries) and under the auspices of the Balal Panchayath. A detailed study conducted by RASTA and the CII team revealed problems of persistent soil erosion and water scarcity and, as a result, a reduced agricultural productivity. The region is hilly, backward and in dire need of conservation. This inspired the team of RASTA to help improve the agriculture activities of the farmers by providing appropriate water and irrigation facilities in the area based on the necessities of the approx. 4,000 inhabitants in the four wards of Puncha, Darkas, Chully and Karyotuchal in Balal Panchayath. In addition to our construction work (i.e. irrigation facilities, check dams etc.) and considering the local circumstances, we formed 10 user groups for the water resources (encompassing the people living within 10 hectares of land) and conducted seminars on various issues related to improving the agricultural production. Starting in February 2013, the implementation of the project, the social mobilization and institution-building activities will be conducted within a period of 3 years. The main objectives pursued in the context of this project are improving the agricultural future of this region in terms of improving the livelihood of local farmers by improving the agricultural production systems, creating and ensuring access to irrigation facilities and enhancing the availability of groundwater. Another aim of the project is promoting ecological and organic agriculture by conducting site-specific farmer-lead experiments with different crops through a process of participatory technology development and circulating the results to more farmers. To date, 9 check dams have been constructed and the structures constructed by the panchayath have been renovated. 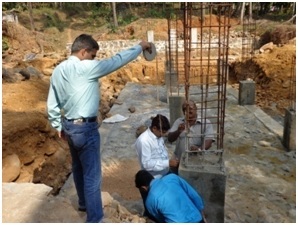 Beyond that, this project yields positive and sustainable result on different levels: all wells nearby the project site now provide sufficient water resources and the groundwater level has considerably increased, which also implies the availability of sufficient drinking water for the local people. Furthermore, the agricultural productivity of local farmers has also markedly increased. This first phase of the project will be completed at the end of June 2015. A second phase in terms of an extension to other regions is already planned and is expected to start in August 2015.